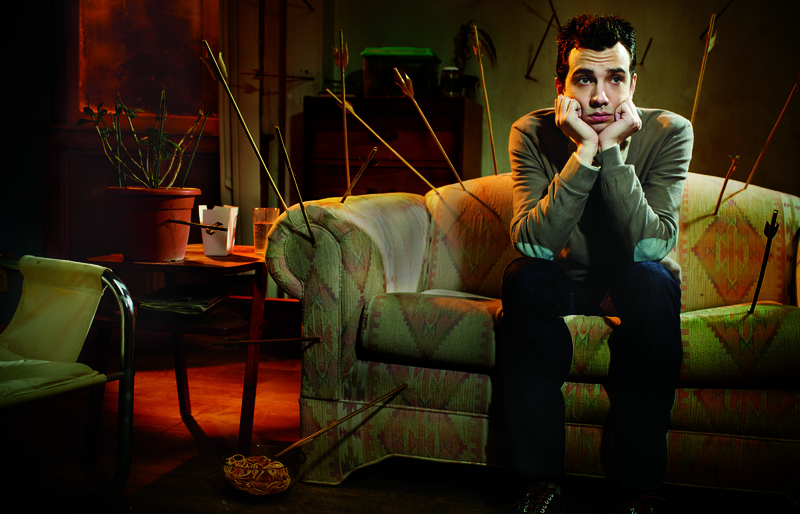 Everyman Jay Baruchel Is Single And Searching On Man Seeking Woman! It’s a situation that’s familiar everyone of dating age – dumping/being dumped by someone and having to re-enter the dating pool. FXX’s Man Seeking Woman (Wednesdays, 10:30/9:30C) is a surreal series that stars Jay Baruchel as Josh Greenberg, a 25-year old guy who’s in that exact spot. Recently, Baruchel spoke with a group of journalists/bloggers, including Eclipse’s own Lora Bofill and me, about the show. Jay Baruchel: Hi, there. How are you? Doing great. Happy New Year. Congratulations on an incredibly funny and hilarious series. I absolutely love it already. Jay: Oh, thank you so much. Happy New Year to you, as well. Thanks for the kind words. I’m really kind of jaded when it comes to comedies. It really takes a lot to make me laugh and I just watched the first three episodes and loved every single moment of them. It’s just wonderful. Did you know –? Did you know when going into it – did you stumble upon this or is this something you developed? Jay: No, no, no. It was just one of those really fortuitous things. I got a call from my manager and (he) said, there’s this really awesome dude called Simon Rich and he wrote an amazing pilot based on his book of short stories and they think you could be the guy. I read it and it was one of these things where, the best way I can describe it is it had the sort of too-good-to-be-true kind of vibe to it. Sort of like when you meet, you know, or I should say when I meet a girl that I find attractive, I just right away assume that there’s got to be something more to it. When I read it, it made me laugh out loud and that doesn’t happen very often. I had this burning urge to be a part of it. It was just like when you read something really good, the clock starts ticking. As soon as you read it, you’re just like oh, no, okay, alright; I’ve got to get this going. Let’s find a way to do this. So, I’m just so bloody grateful that it found its way to me because it’s one of the greatest things I’ve ever been a part of in any medium. So, yes, it was just randomly a script that got sent to me. They were cool enough to have faith and belief that I could do this and we made something pretty funny, I think. Jay, it’s so nice to be talking to you. Glad to see that you guys are shooting out of Toronto. I’m from there originally and it was nice to see all of that. You guys have such a heightened show, but you respond to it all so straight and non-plussed. What do you feel the benefits of this approach are and would it be a fundamentally different show if you did respond to these things like a normal person would? Jay: Yes, I think that the more sort of grounded and real or naturalistic, whatever word you want to use to describe it, the more that we keep our reactions in that realm, the crazier stuff we can do. I think if everybody was firing on all cylinders and constantly acknowledging the insanity in front of us the whole time, there would be no place for this show to go and it would wear itself out pretty quick. I also think those two tones, kind of, they play defense against one another as well as heightening one another. I think our show can go all the crazier because of how sort of small and intimate and real it is and vice versa as well. So, yes, I think there is a massive benefit and I think the show would be way less funny if everybody was going crazy all the time. You said this [indiscernible] to your manager pitched it to you. Were you looking for a TV project? Were you looking for something that was sort of obscure, sort of non-standard? Is that why this appealed to you that it’s just so off-the-wall? Jay: Well, yes. I mean, that’s definitely part of why it appealed to me but, to answer your first question, I wasn’t looking for anything. I really wasn’t. I’ve been sort of really fortunate enough to have been kept quite busy with my other gig, which is writing stuff with my friend, Jesse. I had sort of told my people, we don’t need to hunt stuff down because I’m quite busy as it is. That being said, if awesome stuff comes to us, or finds its way to us, then I’m not an idiot. I’ll go out to read it. So, yes, like I said, I wasn’t jonesing to do anything in particular and I just read this awesome script and that was that. Yes, I loved how strange it was and how truthful it was and how definitive and unique it was. You know, the sort of highest compliment that can pay [indiscernible] is that it felt like something that came out of my head. As [indiscernible] as that sounds, it’s just like you don’t often get to read stuff, as an actor, that feels like it’s something you would have thought of and this felt like that to me. So, yes, I leapt at the chance. I want to know, what are your thoughts on how the women are portrayed on this show, besides the women who are actually trolls? Do you think this series, for lack of a better term, is feminist-friendly? Jay: Oh, Jesus Christ, yes. I mean, listen, I think all of the characters, regardless of their gender, are pretty interesting and well-defined. There is obviously – because of the nature of our show, and how strange it is, there are some archetypal characters at different times but, yes, I think 100%, I think that as you will see, if you keep watching, the title even becomes malleable. 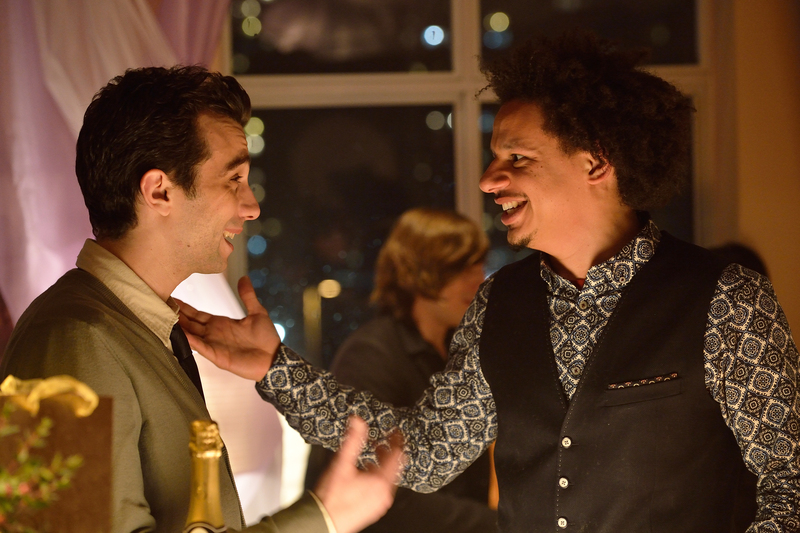 Man Seeking Woman, it happens to be the story of a man, but I think the stories are pretty universal so it could very easily be Woman Seeking Man. Without giving too much away, it might turn into that at some point. But, yes, to answer your question, 100% feminist-friendly. I think it’s just friendly to smart people, I like to think. And, yes, like I said, I think all the characters are pretty well-defined. When you’re playing Josh Greenberg, do you see any parts of yourself or any parallelisms between you and your character? Jay: Oh, always. Not just for him, but, ideally, for every character I play. I think if I don’t find a way to see part of myself in any character I play then I’m sort of not doing my job completely. But yes, no, and with some guys I play, it can hit closer to home than others. I made it through the minefield that is being single in your 20s somehow. So I have, let’s just say, I have plenty of experiences to draw upon for this. A lot of, yes, a lot of victories, defeats, ambitions, malaise, all sorts of – I have the whole panacea of living experiences I’d like to think that I can mine for this. But, yes, hopefully, any part I play has at least a part of me in him. [Indiscernible] is a completely subjective experience and I know that episodes have really highlighted this from the perspective of Josh and, like you said, the perspective could switch, but do you think the show uncovers the myths of dating or is it wanting to explore awkward truths or a little bit of both? Jay: Yes. I mean, I think it probably leans more to the second than the first, although we do try to sort of hit the nail on the head with some stuff. That being said, it’s not meant to be a guide of any sort so much as it is meant to be, you know, when you’re sitting amongst friends at a party and everyone just starts sort of venting and comparing sh** experiences. It’s meant to be that, but it’s also meant to be a celebration of the beautiful stuff, too. So it’s like romance for lack of a better word – this whole stupid thing, there’s nothing like it. You’re happier than you’ll be ever be. You’re sadder than you’ll ever be and, often, stuff in the middle. It’s something that applies to each and every single one of us and so I like to think that when people see this thing they will see at least one thing they went through. Ideally, a whole bunch of things they went through because I this show is about human nature and what it is to be single and to be one of these social animals we call humans. Just with regard to filming on set, obviously you’ve done a lot of work as a writer. You’ve mentioned stuff you’ve done. Obviously, Goon is a great movie. I love that movie. Have you had a hand at all in shaping the show? Have you given notes? Have you polished scripts? Have you worked with Simon on developing the characters? Also, is it a timely scripted show or is there some leeway to improv? Jay: To answer the second question, if we shot the entire show word perfect, it would be every bit as funny as it is now, I think. But I think that’s part of Simon’s genius is that anybody who has ever read anything he’s written is that he slaves over his choice of words and his choice of punctuation. That being said, he knows that this is a collaborative medium, so he always wants us to find our own way into stuff, too. So what you have is, I think, a pretty lovely balance of pretty strong, structured storytelling with some pretty incredible jokes, fused with our riffs, a bunch of which make it into the finished product. So, but, this is Simon’s baby. My job on set is to help him tell his story and to do my best to breathe life into this character he wrote. I’m always chiming in. Whether or not they’re just humoring me, or actually listening to anything I say, I always chime in on any set I have. I just can’t help it. It’s the way my mind and my mouth work, so I’m always pitching ideas and pitching jokes for myself and for other people. Again, this is whether or not they get used and whether or not they’re just humoring me is another question. But, no, we have a pretty amazing staff of writers on this show so we’re well covered. I wanted to know, is there an overall, I’d say, character arc other than seeking love for the show or is it more just kind of slices of life throughout the season? Jay: Yes, both. I mean, there’s definitely both. Again, without giving away sort of the stuff that we know, also they keep me in the dark about certain stuff, too. I think Simon Rich is the only person who knows exactly the complete arc of the show right now. But yes, no, we kind of know where we want him to get to but the other thing is living and dating. These are cyclical things, right? Whereas a movie ends in three acts and a lesson is learned, and that’s very finite, you sometimes have to learn the same lesson. You sometimes find your place and think you’ve got it, only to realize that it wasn’t meant to be and all these different things. So, yes, without sounding too much like it’s a cop-out answer, really both. Yes, definitely both. I was just wondering, are you looking forward, or excited, to hear about people’s reactions when they realize how insane or hilarious some of these sequences actually are? Jay: Yes, man, really. I can’t wait for the world to see it in everything that means. So that means, hopefully, they find themselves surprised at how much they end up giving a sh** about the plot and the characters. I am really excited to see the world react to, yes, how f***ing weird everything is. Yes, I’m so thoroughly convinced that there’s really nothing like it on television and I think it will find its own little spot because I don’t know that any of the promos that we’ve aired yet, or anything we’ve shown about our show, I don’t know that any of it does it justice. It’s the kind of thing that you won’t know what it’s like until you watch it. So, yes, next week can’t come soon enough, man. 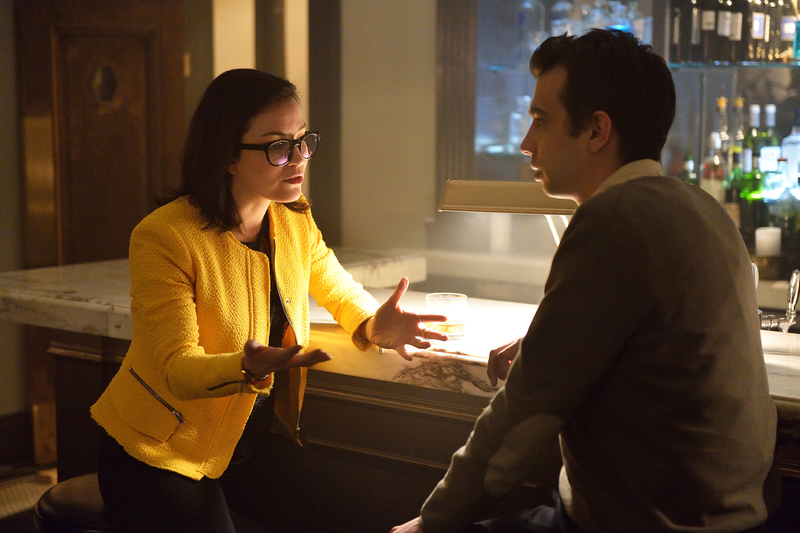 What were some of your favorite moments on filming Man Seeking Woman? Do you have any memorable moments that stand out? Jay: Oh, geez, yes. I just don’t know how many of them are appropriate for this conversation, but I’ll say I got to be around some pretty talented, pretty funny people for three months, including Eric Andre. He’s just a force of nature and I basically got to see him do – I mean, the man is just, he’s devoid of shame and has just a surplus of courage and will do anything. This includes walking around downtown Toronto in -10 Celsius weather completely naked, running from our set to the craft truck and everywhere in between. Again, I don’t know that favorite is maybe the right word to use to describe that anecdote, but definitely most memorable. How does it feel playing with this version of reality in Man Seeking Woman on the small screen after just having played with surreal things in reality on the big screen and This Is The End? Jay: Oh, yes, that’s neat. I hadn’t actually thought of that. Yes, I guess maybe it just sort of speaks to my taste and what I find interesting and the generation I was a part of, or I am a part of, I should say. Yes, I don’t know. I love cartoons, I guess. The Simpsons is pretty much one of my top three favorite things ever, in any format, and so, to me, Man Seeking Woman, at times, feels like a live action version of The Simpsons. It was neat when my mother, I showed her some episodes and, she said that of her own accord, and I told her that, well, one of our writer/producers is a fellow called Ian Maxtone-Graham who worked on The Simpsons for 17 seasons. So, yes, I think I love it. The answer to your question, what’s it like is, I adore it. It’s just– you never get bored. There’s always something new and interesting to find a way to play with and all acting professional, or otherwise, seem to come out of, seem to be born out of play acting when you’re a kid, whether you play house, or cops and robbers, or whatever. When you get to find a way, in adulthood, to show up to work every day with monsters, and aliens, and Hitler, and all sorts of crazy nonsense, yes, you feel like a kid again. You mentioned that you have shared some of your experiences with – or you at least experienced the dating rotation of the 20’s and that you’re not shy about adding your input into the show. Have any of your own experiences been incorporated or are there any that you hope will, should there be a future season? Jay: Oh, yes, definitely. Definitely. Definitely. I’ll say that this first season, there’s stuff that happens to Josh that happened to me, but without Simon knowing that. I think that’s kind of part of the fun and part of the point of the show is that we find a way to distill these kind of universal experiences and truths into these really messed up little half hours. Yes, you can’t be on the set of our show and not join in the complaint fest at some point, right? Just given the nature of what our show is about, there is definitely a bit of group therapy to it where, yes, considering the subject matter, everyone can’t help but chime in with all their own experiences, some of which are funnier than others and some of which we hope to find a way to make fun of next year. You mentioned your day job and I know you’re doing a lot of writing now. You’ve got a couple of other features coming up. I think the Untitled Cameron Crowe Project and The Ten O’Clock People. Can you talk briefly about some of the things you’ve got coming up in addition to this? Jay: Yes. Sadly, The Ten O’Clock People, we could never find a way to – I shouldn’t say we never, we have yet to figure out a way to make that all work, like, you know most movies fall apart. Most movies people will never hear of. It’s a miracle when any of them happen and so I really, really think that would be a cool one to be a part of. I just hope we can figure out a way to do it, but the Cameron Crowe movie, I’m only in like one or two scenes. It’s basically just, Cameron’s the first guy I ever worked for in the States. I’m in two scenes of his movie, Almost Famous, I did when I was 17 and so I’m obviously incredibly indebted to Cameron and proud to know him. We’ve kind of kept in touch over the course of that time since then and he was one of the first people (audio distortion) This Is The End and he reached out to me and just sort of told me how much he liked it and how proud he was and that really meant the world. He said, I’m going to put a part in this new movie I’m making for you. It’s not a big part, but it would be real fun to have you come out and do it and I was like, oh, sh**, yeah, that would be great. So, yes, I get to play Bradley Cooper’s stepbrother, which is very interesting, but, yes, really most of this stuff ahead of me are various writing obligations, trying to get the sequel to Goon going and off the ground. We finally have a script that everyone is psyched about and so we’re trying to find a way to get that going. Then there’s this movie we wrote called Random Acts of Violence, which is based on the comic book of the same name that we adapted into this kind of, what I think is a real cool horror movie that if we can get all of our resources together then I might actually, finally, get the chance to direct something, so that would be pretty dope. So, yes, a bunch of fun stuff going on. I just wanted to ask, you were talking about how there are a lot of crazy elements in the show like, you know, there’s a troll and all that stuff. How was it acting out those more mystical crazy scenes of the show? Jay: Oh, it was so much fun. So much fun. 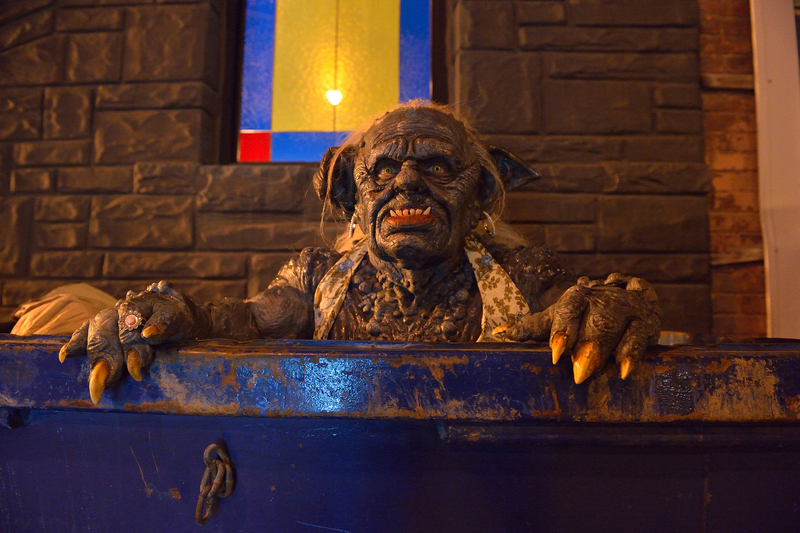 You just really get to use your imagination, although you don’t often have to on our show because we have a genius called Paul Jones who designs and builds all of our crazy monsters and all of our special effects makeup. So, like I said, you use your imagination, but you really don’t actually have to all that much because these things are so real and so alive and so beautiful to look at. You just kind of, you can’t help but remember all the stuff that you’ve loved throughout your life like Dune, or Star Wars movies, or Lord of the Rings. Take your pick. You know, or The Labyrinth, The Dark Crystal, for God’s sake, any of these things, and you get to see that you’re interacting with these creatures. It’s just like, yes, it’s real special and weird and kind of fun and exhilarating and, yes, I wouldn’t trade it for anything. Jay, you work with Eric Andre in this show who is a very seasoned improviser who tends to kind of take the lead with his projects. Did you see yourself giving him a bit of a challenge in terms of improv? Did you guys get a good rapport going? Did you find yourself building off of those moments throughout production? Jay: Oh, definitely, definitely, definitely. I mean, it just, more than anything, I’m just a huge fan and I find Eric very, very funny and he’s someone [indiscernible] harder than most people, so it was very easy to feed off of that. I think fairly quickly he and I kind of developed a shorthand and you’re either on the same frequency or you’re not or you’ll find the frequency that you guys will share, but sometimes it’s just not there. We found ours quite quickly and it got to the point where we were just like, yes, whether they said action or cut, he and I were just always talking sh**. Sometimes we had to – sometimes it’s just a question of focusing it, or aiming it to the story at hand, but yes, no, he’s an incredible improviser, incredible actor as well. Just a really gifted performer and so, yes, you can’t help but be awesomer around him. I just wanted to know, as far as the episodes, do you have any favorite episodes that you shot that really stand out or that you really like a lot? Jay: Oh, yes. There are some that I think are – I mean, obviously, I have an affinity for all of them, but my favorites– obviously, not only yet to be aired, but, have yet to even be mentioned. So I don’t want to give away anything, but I’ll just say that, yes, my favorite moments of the whole series come a bit later into the season. That’s not to say that there aren’t beautiful things the whole time that make me laugh but, yes, I definitely have some favorites and I can’t wait until people see those. The show is very unique and very bizarre. Are you concerned at all that it might not – it might go over the head of some general viewers because it is so, just different. It’s really hard to pinpoint what the show is when I describe it to my friends who haven’t seen it yet. Jay: You know, the same. Yes, I have the same problem. Yes, but I have that same concern on any gig I do because I have yet to figure out the metric, the formula, to what is going to be successful and what’s going to connect to people or not, you know, because there are movies, or TV shows, that are resounding successes that really just don’t speak to me at all and, conversely, there are things that everyone hates that I seem to like. Then there is some stuff that everyone likes that I like. So what I was saying is I have no clue. I did wonder if, yes, it might be too specific for some people, but I think that’s a good thing. That’s a cool thing. I think when you try to make something for everyone you will ultimately make something for no one. I think we have been very definitive and specific and we’ve been true to our vision and our ideas and we’ve done the best show that we could do and whether or not the degree to which it becomes a success, I have no clue, but that’s beside the point. You want to do cool stuff and you hope that people dig it. I know that whatever happens, we did something pretty spectacular. Well, before – I know this is kind of you can’t talk about, but I have to say that war room sequence is classic comedy. I just think it’s brilliant. I mean, I just couldn’t stop laughing after that one. Jay: Awesome. Thank you. Me too, man. Yes, I am pretty proud of that. Now, are you a big social media fan? Are you looking forward to live Tweeting during the show? Jay: Oh, man. I mean, first off, I only have a Twitter. That’s the only form of social media I have. Jay: So, I don’t know what kind of fan that makes me. I like Twitter a great deal. The live Tweeting thing, I’m not sold on it. I love interacting with people. My problem is I don’t know how people have time to actually watch the show when that stuff is going on. I just think that our show is so rich, and moves so quickly, and it’s the kind of thing, like anything good, where you have to watch it more than once because you will keep on picking up on jokes that you missed the first time. I’d hate for people to miss even one of those because I was Tweeting some stupid hashtag at them. But whatever gets people a chance to watch and enjoy it, then I’m fine with it.